This is Owl is ‘A flapping, tapping, clapping interactive book’ which engages young readers by encouraging them to interact with Owl. It’s a fun story to read aloud and, by following a sequence of actions to help Owl, the child becomes really involved in his story. Tickling, clapping, flapping, blowing and tipping the page are all encouraged to help the reader get to know Owl. His disappearance adds a fun element to the story and a mystery for other birds to solve. Owl doesn’t respond to us verbally but through his actions, it is the narrator of the story who keeps up the connection by alternating between talking to him and the reader. We love Jacqui’s bold, eye-catching illustrations which complement the simplicity of the text. Owl is cute although he’s a little aloof until the end of the story when he’s eager to show readers what is in his nest. At the beginning of the story we’re introduced to the fact that owls are nocturnal. 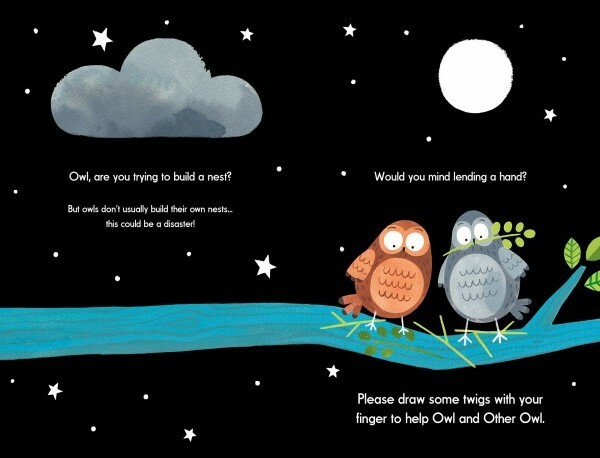 We were also interested to learn that they don’t build their own nests so readers are encouraged to help the two owls by drawing twigs with their fingers. Other animals are also introduced in the illustrations, our favourite character is a vampire bat hanging from a branch – he’s a little bit confused, he thought that he was Owl!! 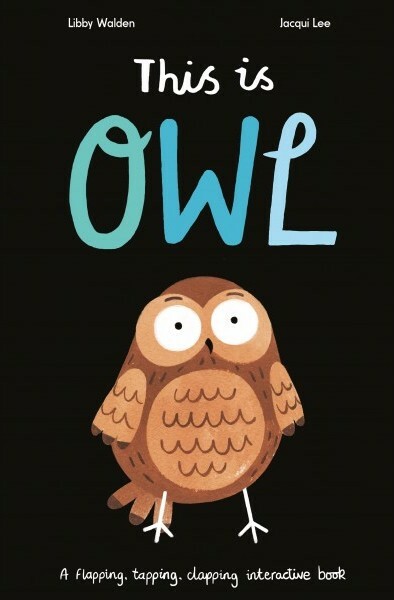 This is Owl would be a great book to read to a group of preschoolers. Along with actions there are also half cut pages to turn, a flap to lift and lots of opportunities to develop vocabulary. Counting, colours and animal recognition can all be encouraged while reading the story which also introduces the concepts of night and day and eggs hatching. 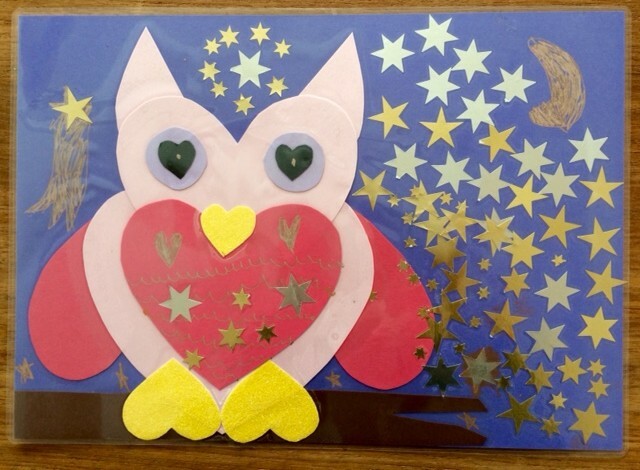 You can also make your own owl picture using heart templates. First make a branch then stick the hearts together in an owl shape. A starry sky completes the picture, we laminated this one to use as a placemat. This is Owl is a simple first picture book story which encourages interaction during reading and makes it a fun and enjoyable experience. They’re great aren’t they although this concept still feels quite new. We’re huge owl fans here too, my mum has owls everywhere in her house! This looks like a lovely book for my youngest nephews. The illustrations are beautiful. We often used to do book related crafts, we had so much fun. I miss those days!